Bigger Than Sneakers Showcase June 28! If you love sneakers, I have great news for you! The “Bigger Than Sneakers” showcase is coming to town June 28. Presented by City G.E.A.R., the event is the biggest of its kind and thousands of sneakerheads are going to flock to the Tri-State to enjoy this expo! At the event, you’ll be able to buy, sell, trade or grow your sneaker collection! The event will be held at the Duke Energy Convention Center from 11 a.m. to 6 p.m. Learn more at www.biggerthansneakers.com. 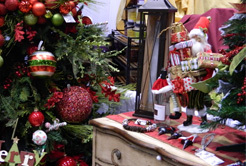 Shop the Cincinnati Holiday Market November 15-17! If you want to get your shopping list finished early this year and enjoy what’s sure to be a fabulous girls day out, head to the Cincinnati Holiday Market! More than 300 chic boutiques will be there and are sure to help you find the right gift for everyone on your list! The event will be held November 15-17 at the Duke Energy Cincinnati Convention Center. You can also print a coupon of $3 off one adult ticket. Cincy Chic is one of the event sponsors, so you know you’ll have a fantastic time! Some Like it Red Hot! Here’s your opportunity to attend the Cincinnati Heart Ball! It’s being held Saturday, February 25th and the Duke Energy Convention Center. Not only do you get to attend a great event, but you get to look fabulous while you’re there! This is a black tie gala with a dinner, auction, and a program! 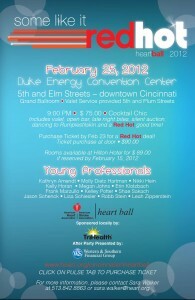 The Heart Ball is being presented by TriHealth Heart & Vascular Services. Eileen and John Barrett will be honored at the event for their charitable contributions to Cincinnati. There will be two live auction items including a trip to the Greenbrier and a trip to Fashion Week! Yay! After the event, there is a YP After Party at 9:00pm costing only $75, whereas the entire event is $300. The after party will include the Rumplestiltskin band and late night party food! Click here to purchase your ticket and we’ll see you there!